Look where else you can find me! Your body spends about nine months growing, nurturing, and feeding your beautiful baby. The placenta is created for your baby, because of your baby. It's the filter between you and baby, filled with extra nutrients, minerals, hormones and goodness. When your child is born, your body no longer needs the placenta and it is born soon after your baby is.. For thousands of years, women from other cultures have realized the benefits of consuming their placentas. In nature, most mammals do the same thing. brings hormones closer to balance, helping with postpartum depression or baby blues. uneaten capsules can help with hard periods and even menopause symptoms when stored correctly. 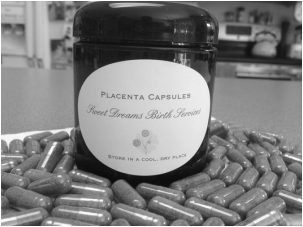 Disclaimer: Placenta encapsulation has not been evaluated by the FDA and is not clinical/pharmaceutical or intended to treat a condition. Women utilizing this service take full responsibility for consuming their placenta at their own risk. Check with your health care provider to be sure your placenta is healthy and safe to consume. Prepared by using the Raw Method, your placenta is picked up within the first couple hours of birth. With great respect and strict adherence to BBP safety and food prep guidelines the placenta is rinsed well, trimmed, sliced thin, and dehydrated. When it is completely dried out, the pieces are then ground to a powder and put into vegetable-based capsules. These are then placed in a dark, sealed jar which is labeled and dated specifically for you. Your placenta capsules (or as some partners call them, "happy pills") are processed and delivered back to you within about 48 hours of receiving the placenta itself.